1. Put the dried mushrooms in a bowl and cover with boiling water; stand for 20 minutes. Meanwhile, preheat the grill to high and grill the bacon for 4-6 minutes until crispy; set aside. 2. Heat the butter in a frying pan and when foaming, fry the chestnut mushrooms over a high heat for about 5 minutes, until browned. Add the garlic and cook for 1 minute more. 3. Drain the porcini mushrooms (reserving the liquor) and add to the pan, stirring to heat through. Add the vinegar and parsley with 200ml of the porcini mushroom liquor, and season. 4. 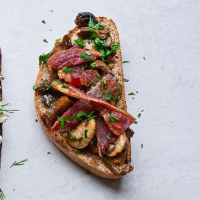 Toast the bread, top with the mushrooms, bacon and extra chopped parsley, and serve.